Don’t let the ghouls and goblins sneak up on you. But even if yours isn’t filled with costume parties, spooky movie marathons, and candy binges, it’s not too late to join in on the fun. Chances are that some of your friends want to dust off last year’s costume and hobnob with the other things-that-go-bump-in-the-night, too. 1. Mummies get hungry, too. Step 2: Don’t forget the Witch’s Brew. A party without drinks? There’s no such thing. For last-minute get-togethers, it’s best to make something that you can prepare in a large batch to minimize hassle and maximize efficiency. Pick one or two of these recipes to make, and you’ll be toasting your fellow witches in no time. Step 3: Is your house haunted? Last but not least, don’t forget to set the mood! It can be difficult to dig up Halloween decorations at a moment’s notice, but there are other ways to make your space festive. Start with music. There are plenty of streaming services that offer entertaining, Halloween-themed playlists. Turning one of these on is the first step to create the right atmosphere. For good measure, put a classic Halloween movie on, muted, in the background. We’d recommend Hocus Pocus, Halloween, or The Night Before Christmas (yes, it’s a Halloween movie!). Lastly, if you’re able, add a few simple decorations. 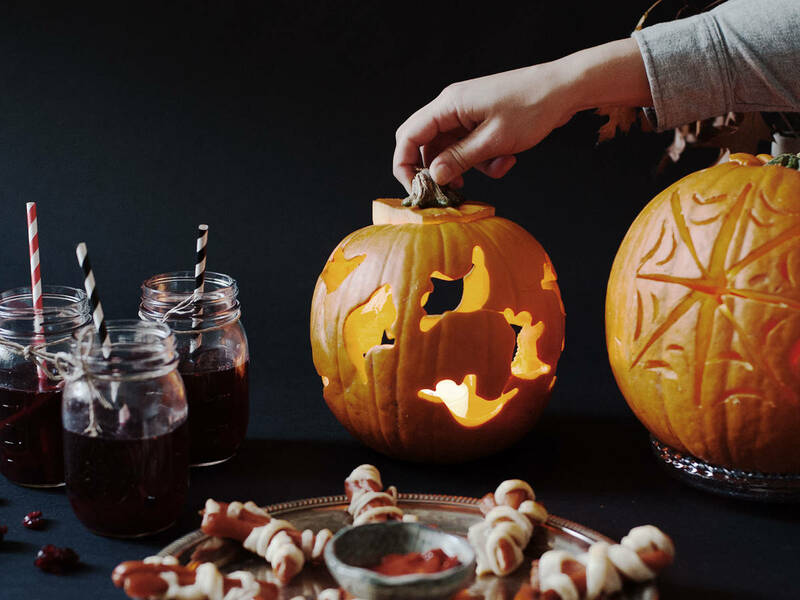 Grab a couple of pumpkins at the corner store—there’s no need to carve them if you don’t have the time, and light as many candles as you can. If the spirit moves you, turn some old cardboard boxes into sinister “Keep Out” and “Beware” signs and drape the furniture with white sheets. If you have cheesecloth lying around, use it as faux cobwebs hanging from mirrors, lamps, and doorways. And no matter what, be sure to sprinkle candy corn and other sweets here and there so that your guests can enjoy the best part of Halloween: the treats!